Please read Sulfur and your Skin first, as it. It will gives a skin deep review of sulfur. Statistically, boys are 4 times more likely to develop autism than girls. 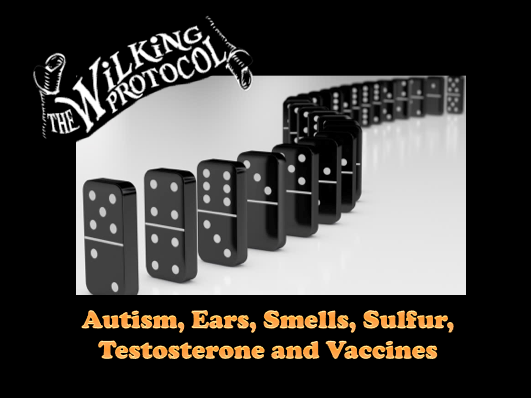 Autism in many cases appears to be testosterone related, and testosterone has a sulfur connection. Mercury has an affinity for sulfur, so MOM would be more likely to release mercury to a developing organ (placenta) and organism (fetus) that is requiring sulfur, and accumulating sulfur, and thus mercury by default. "Both testosterone and 5α-DHT are metabolized mainly in the liver. Approximately 50% of testosterone is metabolized via conjugation into testosterone glucuronide and to a lesser extent testosterone sulfate by glucuronosyltransferases and sulfotransferases, respectively." Notice the testosterone sulfate and sulfotransferase. These are sulfur based. In my opinion, the way out of this trap is to increase the sulfur levels throughout the organism, baby, mom, thus the offending neurotoxins are dissipated, or dispersed, rather than accumulated in a specific area, or organ or organism. The tables may be set for a kind of chain reaction in children, boys, to develop autism if they are deficient in an essential like sulfur. When an injury takes place, as commonly seen with vaccines, the child can have a domino like effect, a cascade of shut downs/damage in the body. Where do we see this problem? I think its taking place in and around the limbic system, which is located right above the roof of the mouth. This is where the optic nerves cross, where the ears connect, centrally located between the sinuses, and where the pituitary and pineal glands sit. Any kind of chronic swelling in this area could cause ‘permanent’ damage. I put permanent in quotes, because if Autism was genetic, we would never see anyone lose their autistic diagnosis. Notice that the olfactory bulb is located within this system. The olfactory bulb is responsible for our sense of smell. Also located right here is where the optic nerves cross. My point in showing this is that this is an incredibly sensitive area. “In Alzheimer's disease (and other forms of dementia), the hippocampus is one of the first regions of the brain to suffer damage; short-term memory loss and disorientation are included among the early symptoms. It is well known that those suffering from Alzheimer’s lose their sense of smell. This has me wondering if the use of something like smelling salts, maybe one time daily as a regular routine, in the morning, might not be a signal to the autistic child, the Alzheimer’s patient that it is time to wake up. I am not recommending that you do this with your parents or your children, but I am postulating that if those connections were brought back, ie SMELL, then its possible those channels might be opened again. For ear problems, look to a deficiency of sulfur and a high body burden of mercury. Ear was is about 60% keratin, and the defining quality of Keratin is Sulfur in the disulfide bond. The Keratin in ear wax kills pathogens and other bacteria and fungus. When sulfur is low, the ears can go into overdrive making earwax to make up for the deficiency. It is estimated there are 2000 sulfur glands per ear. "In addition to intra- and intermolecular hydrogen bonds, the distinguishing feature of keratins is the presence of large amounts of the sulfur-containing amino acid cysteine, required for the disulfide bridges that confer additional strength and rigidity by permanent, thermally stable crosslinking"
The primary components of earwax are shed layers of skin, with, on average, 60% of the earwax consisting of keratin. 'There are four essential trace minerals, Potassium, Magnesium, Sodium and Calcium, which provide necessary protection to nerve cells servicing the inner ear. ‘Magnesium and potassium inside the cell assist oxidation, and sodium and calcium outside the cell wall help transmit the energy produced. The healthy cell wall favors intake of nutrients and elimination of waste products. Potassium regulation is of course crucial because potassium acts as a counter flow for sodium’s role in nerve transmission. The body must put a high priority on regulating the potassium of the blood serum and this becomes difficult when magnesium levels become deficient. The article only mentions mercury in reference to antibiotics making children more susceptible to it. Mercury causes damage and swelling wherever it goes. "Ischemia involves a singeing or pinching of the neural pathways from toxic overload which prevents necessary oxygen from reaching the brain, literally inhibiting normal development, resulting in a series of what are termed “microvascular strokes”, ‘as large white blood cells rush to attack the foreign particles injected into our bloodstream…surround tiny capillaries where the foreign particles land, clog and collapse the capillaries.‘ Dr. Andrew Moulden"
My personal theory here is that the stroke is coming when there is a rush of oxygen coming into the localized injury. For example, it would be akin to a person severely cutting their arm. They then use a tourniquet to stop the bleeding. However, they tighten it up a little too tight and by the time they get to the doctor their arm has turned blue for lack of oxygen. If the blood is let into the arm very very slowly it will limit oxidative damage from taking place. The back end, the bodies and cells ability to open up the veins to take away carbon dioxide must open up at the same rate as the fresh blood coming in, or severe cellular damage can take place. This is why we see so many children who have been vaccinated, that then are administered Tylenol for fever that end up being vaccine injured. Tylenol is thinning the blood stream, and depleting the sulfur stores. It is this ischemic reperfusion injury that is causing autism. The ears are incredibly sensitive, delicate. I believe there may develop a kind of feedback loop that causes us to have a sort of echo, a hearing problem, that stunts us from using our ears. Check out this device that stops people from talking. "With SpeechJammer, you can literally "jam" someone's voice. Through the Delayed Auditory Feedback effect, the speaker will have trouble articulating while speaking, effectively inhibiting his or her speech!" For a child developing speech, this could be devastating to interfere with feedback within the ears. The mastoids are hollow bone in back of the ears. I believe when they fill up with fluid, there goes our hearing, our natural echo system if you will, and our ears stop functioning as they were intended.